Explanation of rating categories appears at the bottom of each review posting. 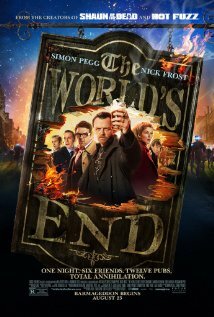 The World’s End is the third installment of a trilogy (that’s not really a trilogy) which started with 2004’s Shaun of the Dead. In the same vein as its predecessors, it’s a personal story set against an incredible backdrop. The story centers on Gary King (Simon Pegg) who has never really moved beyond his end of high school days. Back then he ran with a close-knit group of friends who had wild drinking adventures and thought they ran the place. Fast forward twenty or more years. His friends have all moved on and become successful, but he wants one last shot at completing the perfect night, drinking at all twelve pubs in a sleepy town where they grew up. So he gathers his friends together (grudgingly) and they return home. That is just the setup to a brilliant premise that just goes off the f**king rails at the very end. I don’t want to get into spoiler territory here. The writing is brilliantly clever. The story is strong and endearing, but in its final ten minutes just turns into absolute schlock. Wright and Pegg are smarter filmmakers than this. They weren’t sabotaging their own work, this was intentional, but to what end I don’t know. Anyone who has seen the film will know what I’m talking about, and I’d love to hear some thoughts on why it ended the way it did. If not for this ending, if they went for a more traditional resolution, I wouldn’t even hesitate to give this five out of five in the writing category. But that ending is so baffling I just don’t know what to think. The direction here is absolutely top notch. I’m getting a little into the visual category as well, but I’m not at all exaggerating when I say that Edgar Wright is proving to be one of the best action directors of our age. The combat gets a little unbelievable, only in the sense that a bunch of dowdy forty-somethings shouldn’t be moving the way they do, but it’s all clear, exciting, and edited to perfection. It’s the Matrix style of fancy moves and smart cuts meets the original Indiana Jones, where every punch made sense and you understand the mechanics of what’s taking place. Much like Shaun of the Dead the acting is what elevates this otherwise schlocky material. The characters are well written and the actors reach in to give them warmth and depth. The acting isn’t perfect. The performances aren’t overwhelmingly moving, but they’re better than this type of material traditionally receives. Having already mentioned the editing and fight choreography, the entire look of the film is perfect. As he did with Shaun and Hot Fuzz, Edgar Wright manages to capture an England often overlooked by filmmakers trying to reach non-British audiences. Where most film makers would choose to flood their film with establishing shots of London and tube stations, he goes for the suburbs or rural town centers. He manages to portray a land thousands of miles away from the United States, but populated with a life not entirely foreign to us. I wouldn’t dare insinuate that his intend is to create a film Americans will love. Far from it. He creates films he loves. And it shows. Would I recommend this film? If you liked Shaun of the Dead and Hot Fuzz, without question. Even if you’ve never seen those films, please check this one out. Maybe leave when the car is driving away at the end (spoiler? I don’t think so). All ratings are on a 5 point scale where 1 is the lowest possible score. A score of 3 indicates the film was simply effective in this regard. A score of 5 indicates perfection in a given category. The overall rating is a simple average of the four scores. Story -- How well the film was written? Did the story make sense? Were there plot holes? Was the dialogue natural for the style/genre? Direction -- How well was the film put together? Did all of the elements come together properly? How was the pacing? Was the tone consistent and effective? A subcategory of this would be editing, but for the purpose of these reviews it is combined into one category. Acting -- How good were the performances? In a drama did the lead actor/actress draw the audience in? In a comedy where the performers funny? This is an amalgam score of all the performances in the piece. A single great performance can elevate the entire score, but a bunch of bad performances can just as easily bring it down. Visual -- How did the film look? If there were visual effects were they used appropriately and did they look good? Did the overall look enhance the telling of the story?